PixaFlux is an advanced PBR Texture Composer. Improve your assets textures with the advance Node graph power of PixaFlux. 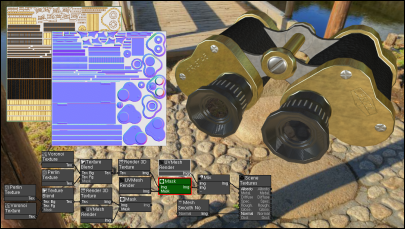 PixaFlux supports Albedo-Metalness PBR workflow and Diffusse-Specular PBR workflow. PixaFlux is evolving day by day and for the past 10 months we have been busy upgrading it to support custom reusable node groups. This is the second public release of the new PixaFlux. All nodes and features from previous versions have been tested and upgraded or modified to fully support common attributes and reusable custom nodes. The Attributes node can be used to define attributes to be reused on multiple nodes. Attributes can be exposed as inputs and flow through the node graph as node values. The Node Graph node allows projects to be used as custom nodes. Value IO nodes provide input and output definitions for custom nodes. Images have a new Pivot property. Compose textures for 3D models. Create and compose textures for your Unity 5 and Unreal models. Use images as textures in your 3D models. Bake procedural textures into 3d models. Soften 3d model hard edges. The Free Form node has been deprecated.